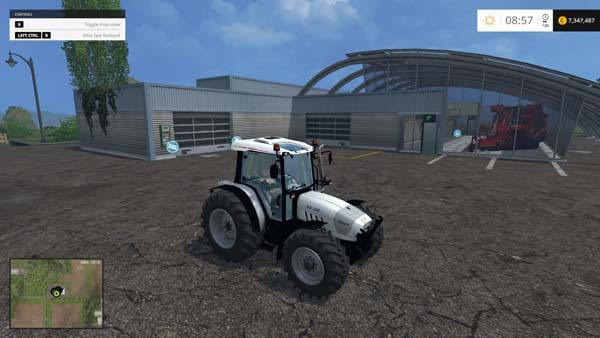 In R4 is an ideal multi-purpose tractor. it is ideal for any agricultural application. Reliable and versatile, but with the stigma of the features you would expect from Lamborghini: exclusive design, ergonomics and performance. Strong tractor clear, strong lines. Simple but impressive shapes and sophisticated details create exclusivity typical Lamborghini. With a capacity of 4,038 cubic high-pressure common rail injection and turbocharger with intercooler, these engines deliver impressive power.On R4 has an impressive torque reserve for extraordinary traction force and continue to work undaunted even in the most difficult conditions. Electronic control of fuel injection and programmable engine rpm for optimum flow and maximum performance. The powershift transmission with proportional solenoid valves allows the driver to constantly vary the speed with respect to the load, for extraordinary overall performance (sixty-front/rear speed, and maximum speed 40 km/h with the engine at economical speed).The sense clutch hydraulic reverse Shuttle with adjustable reaction and stop & go system makes the tractor is very maneuverable even in tight spaces.Over speed function for enhanced fuel economy, and available in four speed version PTO (540/540ECO/1,000/1,000 ECO) or as synchronous execution with independent shaft. Hydraulic system with dedicated 58 l/min pump (or optional 90 l/min pump) for superior performance, and a separate independent pump for the hydrostatic steering system. Available with three (or four) of electronically controlled proportional distributor with flow regulator and timer. Optimized fuel consumption with the “energy saving” system. Independent 44 l/min pump provides overall steering without sucking power from the main hydraulic system.The electronically controlled rear lift with a lifting capacity of up to 6,600 kg (with two optional additional connectors). Roomy, ergonomic cabin with integrated analog and digital equipment. Excellent review onward and upward, with a panoramic roof with large glass panels; and excellent visibility at night, too, with six working lights on the cab roof and at mid-height on the tractor.Comfortable work environment, with four-speed ventilation system boasting ten adjustable vents in the headliner and the console.Air conditioning is available in all models.